Learn about the questions your child will encounter, gain effective study methods, and access the largest free practice test available anywhere — with 50 free questions and answers for the NNAT2 and OLSAT. Our Beginner Practice Book is designed to introduce students to the basic rules and logic for each question type on the exam. Many students require coaching at the Beginner Level before they are ready to tackle the Intermediate Level questions. This set contains 40 NNAT2 and 36 OLSAT questions, as a printable PDF. Our Intermediate Practice Book is designed to mimic the bulk of the questions found on the actual exam. If your child feels confident at the Intermediate Level, they will likely be well prepared for test day. Our Expert Practice Book is designed to challenge students who can consistently perform well at the Intermediate Level. There will likely be a few questions of the Expert Level difficulty on the exam, specifically the questions geared towards 1st grade entry students. This can also be used as an introductory set for 2nd grade entry students. 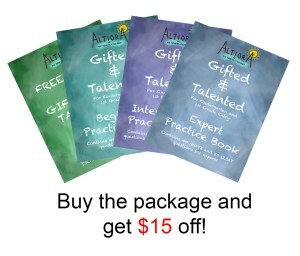 Just to say thanks, if you buy all 3 of our practice sets, we’ll take $15 off. Download includes the free guide book and practice test. 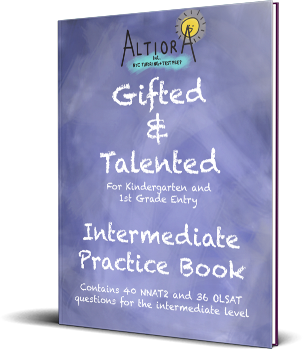 In total, this set includes 278 practice questions, hand crafted by our educational experts. Getting Into Medical School: The Ultimate Guide for the Anxious Premed is the first of Altiora’s publications. 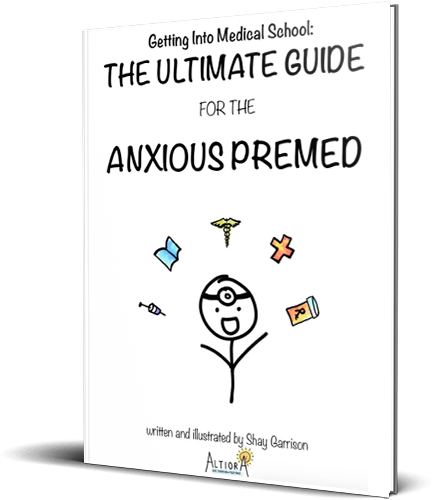 Written by Altiora founder and CEO Shay Garrison, this helpful and hilarious guidebook leads premeds from the first day of college to the first day of Medical School. So, if you’re interested in the world of medicine (or know somebody who is), give it a read!